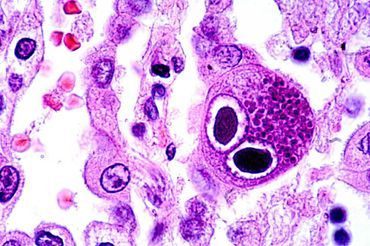 Human cytomegalovirus (HCMV) pneumonia is a widespread cause of death in HIV-infected children. A seminal autopsy study from Zambia in 2002 histopathologically confirmed HCMV as the primary cause of death in 22% (40/180) of HIV-infected children. Subsequent molecular analysis on the same specimens suggested the true prevalence of active HCMV infections could be much greater. South African studies have detected HCMV viremia in 36% of HIV-infected children with severe pneumonia, more prevalent than Pneumocystis Jirovecci Pneumonia (PCP), and in up to 72% of children ventilated and failing antibiotic therapy. In these studies HCMV pneumonia was treated with Ganciclovir, resulting in a 50% reduction in mortality, but there is no controlled evidence base for safety, efficacy, dosing and route of administration in this patient group. Randomized control trials for anti-HCMV drugs in this setting cannot be justified without more extensive baseline data to determine prevalence and diagnostic cut-offs linked with mortality. We will approach all children aged <15 admitted with severe pneumonia (in accordance with the WHO definition). We will include all children irrespective of HIV status to get a thorough measure of prevalence, and anticipate a 4:4:2 split between HIV-infected, HIV-exposed and HIV-uninfected -unexposed children. We will recruit roughly 36 patients/month (90% of all eligible patients) and anticipate an HCMV prevalence of roughly 68% based on a recent study from South Africa. Using the standard sample size calculation method for prevalence studies, we calculated a sample of 322 patients. This sample is sufficient to accurately assess prevalence of HCMV pneumonia. The primary outcome is death, and secondary outcome is time-to-discharge (as a general measure of morbidity), and we will compare HCMV viral loads, in different specimen types, between survivors and mortalities, and look for any correlation with time-to-discharge. We will attempt to define a viral load cut-off that is highly predictive of mortality. Pneumonia is the leading cause of childhood mortalities globally, despite widespread use of broad-spectrum antibiotics. Viral causes of pneumonia have been severely neglected, due to the expense or lack of anti-viral drugs, but there are new drugs and formulations in the pipeline, and the HIV pandemic has shown that affordability increases where there are large markets. Our autopsy studies have demonstrated that HCMV is one of the leading viral causes of fatal severe pneumonia in HIV-infected children, and anti-HCMV drugs are already in use and saving lives in South Africa. This study will provide crucial evidence that will inform directly on the merits of future trials of anti-HCMV drugs in this patient group, and on appropriate study design. If the results indicate that trials are justified, we would be optimistic of securing funding for a phase 2b RCT. A review of all available autopsy data from children in sub-Saharan Africa, indicated CMV pneumonia as a cause of death in 20% of HIV-infected paediatric mortalities . Recent publications have identified HCMV viremia in 36% of HIV-infected children with severe pneumonia (more prevalent than PCP), with use of the anti-CMV drug Ganciclovir, resulting in a putative 50% reduction in mortality . In another study HCMV pneumonia was detected in 72% of infants ventilated and failing antibiotic therapy, with the authors calling for empirical use of Ganciclovir in such high-risk patients . A viral load cut-off of 10,000 copies/ml sera captured 70% of culture confirmed cases of paediatric CMV pneumonia . 2) Prevalence and outcome of cytomegalovirus-associated pneumonia in relation to human immunodeficiency virus infection. Zampoli M, Morrow B, Hsiao NY, Whitelaw A, Zar HJ. Pediatr Infect Dis J. 2011 May;30(5):413-7. 3) CMV pneumonia in HIV-infected ventilated infants. Goussard P, Kling S, Gie RP, Nel ED, Heyns L, Rossouw GJ, Janson JT. Pediatr Pulmonol. 2010 Jul;45(7):650-5.